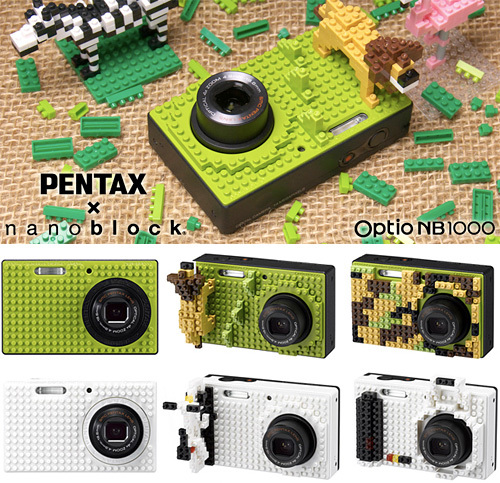 PENTAX Optio NB1000 Can Be Customized With Nanoblocks | OhGizmo! Yesterday PENTAX announced their new Optio RS1000 14MP, 4X optical zoom P&S digital camera that also happens to have a removable transparent acrylic panel on the front allowing you to customize it with swappable skins. But even more exciting is the RS1000’s fraternal twin, the NB1000, which features a studded building-block friendly faceplate instead. Now before you get too excited, the NB1000 is only designed to be used with a Japanese building toy called Nanoblocks (hence the ‘NB’) which looks to be incompatible with LEGO given the stud sizing and spacing. But it is the first camera that can technically be customized in 3D, so there’s finally a reason to get excited over that buzzword! Now I have no idea why anyone would want a building block lion or bicycle hanging off the front of their camera, but the Optio NB1000 will be available in Japan in the two base sets pictured above for ~$240 (¥20,000) later this year.